THURSDAY, Dec. 24, 2015 (HealthDay News) -- British researchers say that losing 1 gram of fat from the pancreas can reverse type 2 diabetes. The catch? No one has yet figured out how to lose weight just from the pancreas. And, this small study's findings suggest that to lose that much fat from the pancreas, someone with type 2 diabetes would need to have weight-loss surgery, or diet long enough to lose about 15 percent of their body weight. While the study doesn't promise a quick fix for type 2 diabetes, it does add to the understanding of the disease, according to the study authors. "In people with type 2 diabetes, weight loss over eight weeks [after weight-loss surgery] caused pancreas fat to decrease and insulin production to normalize. But in people with normal sugar control, exactly the same weight loss caused no change in pancreas fat," said Dr. Roy Taylor, a professor of medicine and metabolism at Newcastle University in England. "We can conclude that a particular pool of fat in the pancreas has built up in type 2 diabetes, and draining this pool allows function to normalize," Taylor said. Findings from the study were published online recently in the journal Diabetes Care. Type 2 diabetes affects more than 9 percent of the U.S. population, according to background information in the study. The exact cause is still unknown, the researchers said. Experts do know that insulin resistance plays a role in its development. Insulin is a hormone necessary for the body to use the sugars from food as fuel. When someone is insulin-resistant, the body doesn't use insulin efficiently. This increases the body's demand for insulin. Eventually, the cells that produce insulin -- beta cells in the pancreas -- can't keep up with demand, and that's when type 2 diabetes develops, the study authors said. Excess weight is a risk factor for type 2 diabetes, but it isn't the only one. "It is very clear that individuals differ in their susceptibility to type 2 diabetes. 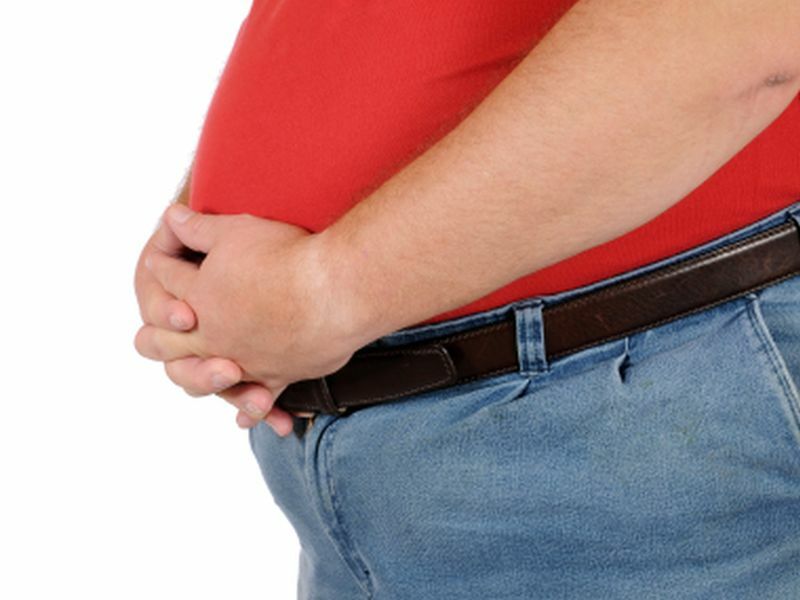 If an individual is not genetically susceptible to the disease, they can become very obese without fat building up in the pancreas -- 80 percent of obese people do not have type 2 diabetes," Taylor said. The new study included 18 people who'd had type 2 diabetes for fewer than 15 years. The average time since diagnosis was about seven years. For comparison, the researchers also recruited nine people with similar weights and ages, but without type 2 diabetes. The researchers used a novel type of MRI that could measure fat lost from the pancreas and from the liver. Eight weeks after surgery, weight loss was similar in both groups -- about 13 percent of initial weight. But, when the researchers compared fat lost from the pancreas and liver, they saw a big difference between the groups. People with type 2 diabetes lost weight from the pancreas and the liver, while people without diabetes saw little change in the amount of fat in these organs. Insulin production returned to normal in people with type 2 diabetes, the study found. In those without diabetes, the research showed no changes in insulin production. Although the study looked at weight loss brought about by surgery, Taylor said dieting to lose about 15 percent of your body mass would probably produce similar results. Dr. Joel Zonszein is director of the Clinical Diabetes Center at Montefiore Medical Center in New York City. He said, "In people who have fat where it doesn't belong -- in the pancreas and in the liver -- removing that fat improves diabetes. Even after seven years or more, the pancreas can recover very nicely." Taylor and colleagues "were able to show an amazing restoration of the beta cells. They're not dying, they're just knocked out, and can come back to normal. That's really nicely documented in this study," Zonszein explained. "This study shows how a dramatic change in weight can change metabolism and improve type 2 diabetes," he added.